Breakfast and dinner are usually the big meals I fix when camping. I like to start our day with a big meal to fuel us for all the hiking and exploring we may have planned. Besides, how often in our busy lives do we get to enjoy a leisurely breakfast with our families? 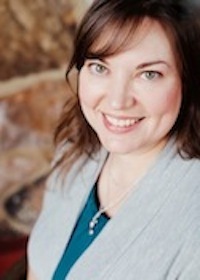 Breakfasts I have served are pancakes (mix the dry ingredients in a freezer bag, writing what we ingredients to add on the outside of bag), Hashbrown-Sausage-Egg Foil Packets, and eggs with bacon or sausage served with muffins baked ahead of time. Here is what I planned for our lunches and breakfasts when we went camping in Yellowstone in 2006 (lots of eggs and pancakes, except for gluten free cereal on the days we needed to break camp early). If you like to use pie irons for your campfire cooking, you should check out the breakfast pie iron options from my camping food series last year with Going Free. 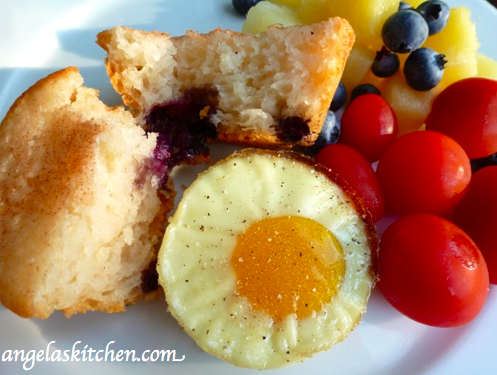 For my breakfast meal this week, I made Blueberry Miracle Muffins and Eggs in a box oven. 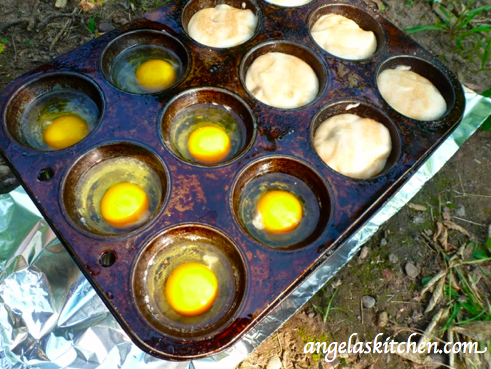 If you have a box oven, you can bake all sorts of things right in your campsite including breakfast muffins. The bonus is that it is a fun experiment for the kids! 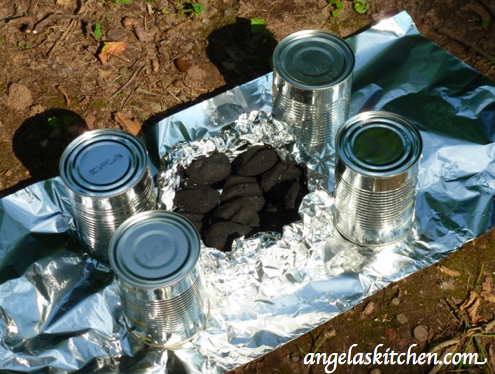 To make a box oven, you need foil, a box, 4 empty cleaned cans of equal size and charcoal briquets. I like to use the boxes you carry groceries in. The handles make natural vents on the oven, but if using a regular box, simply cut out two small handles on two side to use as vents. Using foil completely line the box with foil, leaving NO exposed areas. 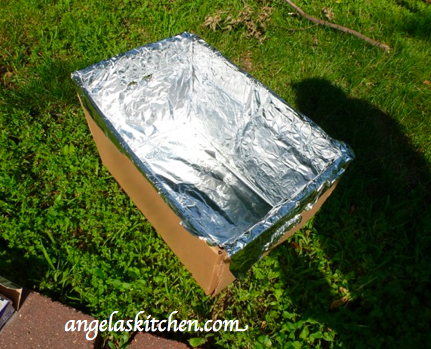 Next, place a piece of foil on the ground a little large than the box. On top place another piece of foil that has been doubled and edges crumpled, making a bowl to contain 12 to 14 charcoal briquets. Figure about 35 degrees F per briquette, adding a couple more for good measure. Place the cans opening side down around the charcoal packet. Before lighting the charcoal, make sure the pan you will be using fits on top of the cans. The cans will keep the pan steady and at a good distance from the heat source. Remove the pan. Light charcoal, allowing it to flame. When the charcoal is grey and no longer flaming, it is ready to go. Prepare your batter while waiting for the charcoal to stop flaming. The temp of the box oven will get to about 350 degrees F, so set a oven guard if you have kiddos who may be running around your camp spot. Bake for the amount of time specified in the recipe you are using before checking on how things are cooking. Remember, every time you lift the box, you are releasing heat that will need to allow to build up again. If I think that muffins would need to bake an extra 5 minutes in your home oven, have them bake for 10 minute in the box oven to give the box oven a chance to heat back up and bake. When done with your oven, carefully move the hot briquets to the fire pit at your camping spot and be sure they are completely extinguished. And there you have it: Box oven baking! Easy-peasy and totally fun! 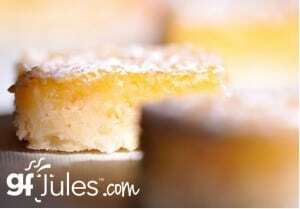 You can make any muffin recipe you desire, scaled down to 6 muffins. I used Better Batter Pancake & Biscuit Mix for ease of use, cutting the Magic Muffins recipe on the side of the box in half, and adding blueberries. For the eggs, I simply baked them, but you could top them with salsa, scramble them with finely diced veggies, etc. before baking if that is how you roll. 1/2 cup blueberries, or other berries, chopped nuts, gluten & dairy free chocolate chips, etc. 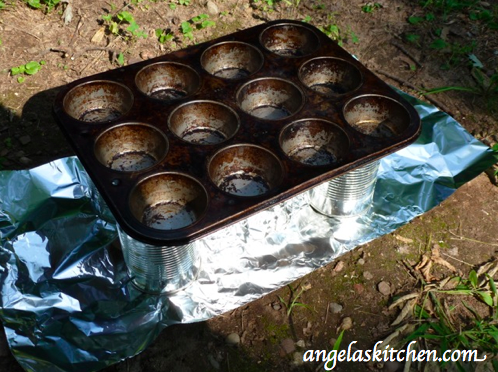 Oil 12 cup muffins tin. Crack one egg each into 6 of the cups in the tin. If desired, scramble eggs in a separate bowl, adding spices and finely diced already cooked veggies before dividing into 6 cups of the the muffin tin. Stir together the biscuit mix, sugar, milk substitute, and oil until smooth. Stir in blueberries. Divide batter between remaining 6 cups in the muffin tin. Sprinkle with cinnamon-sugar, if desired. Bake in box oven (about 350 degrees F) for 20 minutes before checking. Meal is done when eggs are set and muffins are cooked through. So, how about you? 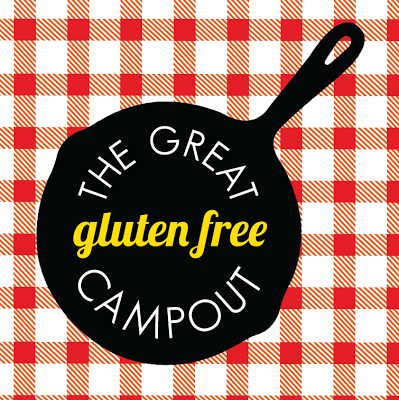 Do you have an awesome gluten free camping recipe you would like to share? Link it up! We would love to see it! Wonderful, Katie! I'll stop by and check it out. 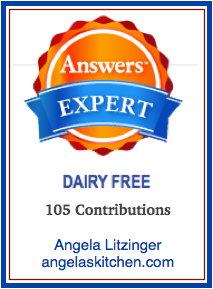 I love your fermenting/pre-soaking goodness (I am a one of your blog stalkers- LOL) and thrilled you joined in. Can't wait to check out the printables! Thanks! WOW! I have NEVER heard of this idea but darn if it's not going to make my grilled pizza idea about 4000 times easier!! YUMMO! Hi, Naomi. Glad you like it! When I saw them at Girl Scout Camp a few years ago, I couldn't believe it. Such a fun idea! 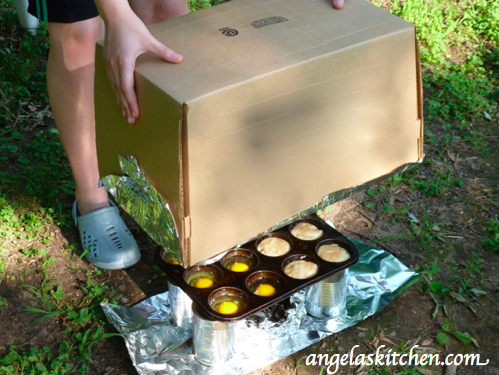 Box Oven Brownies are a staple dessert every year at Girl Scout camp. :) When I make grilled pizza, I par-bake my crust before packing to take camping (see this post for how I do it: http://angelaskitchen.com/2012/06/27/camping-gluten-free-fire-grilled-pizza-and-short-cut-smores/). Works like a charm!